Vaccines have virtually eliminated many diseases, but public concerns about their safety could undermine future public health initiatives. To determine Canadians' attitudes and knowledge about vaccines, particularly in view of increasing public concern about bioterrorism and the possible need for emergency immunizations after weaponized anthrax incidents and the events of September 11, 2001. A 20-question survey based on well-researched dimensions of vaccine responsiveness was telephone-administered to a random sample of N = 1330 adult Canadians in January, 2002. 1057 (79.5%) completed the survey. Respondents perceived vaccines to be highly effective and demonstrated considerable support for further vaccine research. 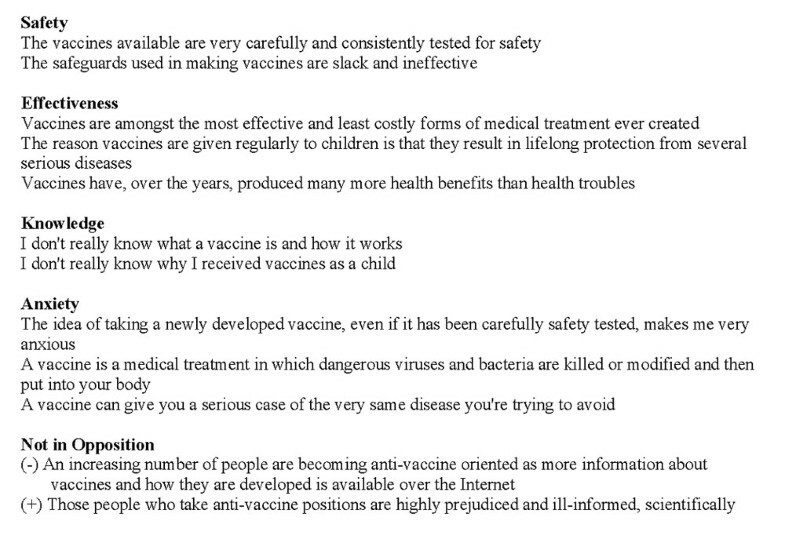 However, results also indicate a lack of knowledge about vaccines and uncertainty regarding the safety. Support for vaccines is broad but shallow. While Canadians hold generally positive attitudes about vaccines, support could be undermined by widely publicized adverse events. Better public education is required to maintain support for future public health initiatives. Immunization against infectious disease has probably saved more lives than any other public health intervention, apart from the provision of clean water . Vaccination programs are among the most effective public health initiatives undertaken, credited with eliminating small pox, virtually eliminating polio and substantially reducing the illness burden of infectious diseases such as diphtheria, pertussis, and measles . Vaccine technology has recently been profiled in the international press with emphasis on research aimed at new vaccines for Human Immunodeficiency Virus (HIV) and cancer [2, 3]. Terrorist threats have also focused attention on anthrax and smallpox vaccines as one means of public protection against bioterrorism [4, 5]. While vaccines have provided benefits, the effectiveness of new and existing programs depends on the acceptance of the public, which is increasingly challenged by concerns about safety, particularly given possible findings linking multiple sclerosis and the hepatitis B vaccine, and allegations of linkage between autism and measles, mumps and rubella vaccines [6, 7]. While most public health officials and epidemiologists believe these fears to be unfounded, such fears undermine the effectiveness of vaccination programs. To provide an empirical basis for public education efforts, we undertook a national survey to better understand the public's acceptance of current and potential future vaccinations and to explore their attitudes and levels and types of knowledge. The survey instrument consisted of 20 statements to which subjects could respond "strongly agree", "agree", "neither agree nor disagree", "disagree", "strongly disagree", and "don't know enough to comment". Item selection was based on review of past surveys of attitudes and knowledge in relation to vaccines [8–23], current informational materials for the Canadian public [24, 25] and expert review of item alternatives. The review panel consisted of 2 health psychologists, 2 internal medicine specialists, 4 research immunologists, 1 public health oriented epidemiologist, 1 survey research expert and 2 nurses. Instrument content was primarily devoted to 8 domains that figured prominently in past surveys and informational materials. These domains were: vaccine safety [8–21]; vaccine efficacy [8–21]; vaccine knowledge [8–21]; vaccine acceptability [8–23]; anxiety about vaccines [8, 10–21]; and opposition to vaccines [8, 20, 23]. In addition we focused on attitudes towards vaccine research and perceived religious barriers to use of vaccination. One indication of the centrality of the dimensions focused on in this study, particularly in the Canadian context, is that vaccine safety, efficacy and knowledge are the first topics addressed in the current Canadian Immunization Guide  and in Your Child's Best Shot – A Parent's Guide to Vaccination  (Canadian Pediatric Society), arguably two central sources of vaccine information and promotion in Canada. In addition to the centrality of these dimensions in prior vaccine research, our rationale was that if education and promotion efforts are focused in these areas, it is important to derive nationwide Canadian data about these dimensions of vaccine response. The survey was carried out between January 4 and February 4, 2002 on a randomized sample of 1330 Canadian adults, aged 18 years and older. There were separate randomizations for the 3 largest cities, Montreal, Toronto, and Vancouver, with percent population per province and per city representative of Statistics Canada regionalized gender data (of the population > or = to 18 years in 2000–2001). The sampling process was performed by Canada Survey Sample (CSS), a selection engine that generates random samples of residential telephone numbers. The CSS maintains a comprehensive list of all populated exchanges across Canada, and is updated regularly. The CSS randomly generated 4-digit suffixes for these exchanges, in proportion to the percent population of the individual exchanges. As each suffix was generated, it was compared to the database of existing, known phone numbers. If it matched a listed phone number, it was placed in the 'valid number' file. If it did not, it was placed in the 'orphan' file. The valid number file was used as the primary calling list and was supplemented with numbers from the orphan list. As was true for the randomized procedure described above, numbers were chosen from the orphan list in proportion to the percent population of the exchanges. Since a significant number of "not-in-service" numbers were encountered, a slightly higher than normal ratio of respondents were sampled to ensure timely and efficient survey fieldwork . The data were initially weighted by region and gender because the near-perfect regional and gender representation achieved by interviewing alone was disturbed by the process of refusal conversions, which were undertaken to achieve a high response rate. In this survey, the demographic characteristics of the sample and the responders so closely approximated the true population that use of weights did not alter results and, accordingly, weights were not employed in analyses. Descriptive statistics (frequencies, means, standard deviations) were calculated to characterize the respondents and their survey responses. As 18 years was the minimum age for inclusion, the 6 respondents who gave 1984 as their year of birth were presumed to be 18 by February 4, 2002. Categories of age were constructed, based on quartiles of the distribution, for categorical analyses. Relationships between variables were evaluated by employing chi-square, correlational, ANOVA, MANOVA and forwards stepwise logistic regression analyses using SPSS for Windows . Of the individuals contacted by telephone, 79.5% agreed to complete the survey (N = 1057). Demographic characteristics of the 1057 respondents are shown in Table 1. Year of birth was not provided by 30 respondents. The mean age of respondents was 44.78 years, with females (n = 513) slightly older (mean ± SD age = 45.9 ± 16.8 years) than males (n = 514, 43.72 ± 15.56, p < 0.05). More males (n = 321) were employed full-time than females (n = 213), while more females (n = 236) than males (n = 157) were unemployed (p < 0.001). Unemployed respondents were older (53.64 ± 16.2 years) than those working full-time (40.2 ± 10.15) or part-time (36.08 ± 14.91, p < 0.001). Responses are shown in Table 2. In general, the responses of subjects reflected positive attitudes. However, significant proportions demonstrated negative attitudes, insufficient knowledge and uncertainty. On the question, 'The safeguards used in making vaccines are slack and ineffective', 40.4% indicated insufficient knowledge, 4.8% indicated uncertainty, while 10.5% agreed with the negatively worded statement. A positively worded question, 'The vaccines available are very carefully and consistently tested for safety', yielded similar results as 22.9% indicated insufficient knowledge, 4.5% indicated uncertainty while 5.3% indicated negative attitudes to the question. The most direct assessment of insufficient knowledge was evident in responses to two items – 'I don't really know what a vaccine is and how it works' and 'I don't really know why I received vaccines as a child'. Nearly one-third of respondents (32.1%) endorsed these items in ways indicating insufficient knowledge, uncertainty, or an inability to comment. The idea of taking new vaccines seemed to provoke anxiety as indicated by responses to the item, 'The idea of taking a newly developed vaccine, even if it has been carefully safety tested, makes me very anxious'. In all 42.6% of subjects 'agreed' (33.8%) or 'strongly agreed' (8.8%) with this item. When the acceptability of specific vaccines was surveyed the most acceptable potential vaccine was hepatitis C with 72.6% of respondents affirming acceptability. A potential HIV-AIDS vaccine was nearly as acceptable, with 67.2% affirming acceptability. Less acceptable were vaccines associated with potential bio-terrorist threats as only 50.6% indicated an anthrax vaccine was acceptable while 65.4% indicated a small pox vaccine was acceptable. It was also evident that government endorsement of terrorist – protective vaccines was not a definitive influence in promoting acceptability as only 55.8% of respondents would take 'whatever vaccine was promoted by the national government and its medical advisors'. In terms of general views of vaccine efficacy, subjects were highly supportive with 79.4% endorsing either 'agree' (45.8%) or 'strongly agree' (33.6%) to the item 'Vaccines have, over the years, produced many more health benefits than health troubles' while 58.7% endorsed either 'agree' (41.5%) or 'strongly agree' (17.2%) to the item 'Vaccines are amongst the most effective and least costly forms of medical treatment ever created'. Over one-third of subjects indicated awareness of organized opposition to vaccination programs with 37.2 % endorsing either 'agree' (27.1%) or 'strongly agree' (5.7%) to the item 'An increasing number of people are becoming anti-vaccine oriented as more information about vaccines and how they are developed is available over the internet'. A majority of subjects (61.7%) were reluctant to dismiss anti-vaccine positions, evidenced in their response to the item, 'People who take anti-vaccine positions are highly prejudiced and ill-informed, scientifically' (27.9% – disagree or strongly disagree, 25.4% – don't know enough to comment, 7.7% – neither agree nor disagree). The value of vaccine research was strongly supported, with 86.8% positively endorsing the item, 'The government should invest more money in the development of vaccines for serious diseases like AIDS, Hepatitis, and Cancer' (strongly agree – 46.8%, agree – 40.0%). There was little evidence that religious beliefs presented a barrier to vaccination. Only 2.7% of respondents endorsed the item, 'I have religious beliefs that prevent me from taking vaccines'. Of the 28 people who said that religious reasons prevented them from taking vaccines, 9 (32%) agreed to take all 6 vaccines described, 7 (25%) agreed to take 5 and only 4 (14.3%) agreed to take none. Of the demographic variables, only employment status was related to willingness to take vaccines. Respondents who were not presently employed agreed to take 3.75 (±1.86) of the vaccines but those working full-time agreed to take 3.4 (+1.9) (p < 0.05). We categorized responses to each question as "positive", "negative", or "don't know/undecided", with "positive" indicating vaccine acceptance, "negative' indicating vaccine opposition and "don't know/undecided" indicating neither agreement nor disagreement, or insufficient knowledge to comment. We calculated the number of survey questions for which each subject responded "positive", "negative", and "undecided/don't know", as a summary measure of attitudes towards and knowledge of vaccines. Table 3 shows the effects of demographics on the number of vaccine-positive, vaccine-negative, and don't know/undecided responses. Females were less knowledgeable and more frequently undecided than males and there was a significant linear trend towards more vaccine-positive, fewer vaccine-negative and fewer don't know/undecided responses, with increasing education. There were no significant differences in any of the other demographic variables. Among all respondents, 'don't know enough to comment' was endorsed on an average of 3 (3.08) of the 20 survey questions (SD= 2.72, range = 0 to 16), on average. Gender, employment status and education were significantly associated with the number of "don't know enough" responses, as assessed through a MANOVA. Females responded that they did not know enough to comment on more questions (3.30 ± 2.73) than males (2.86 ± 2.68 (p < 0.01). Higher education was associated with fewer "don't know enough" responses (p < 0.001) with the mean number of "don't know enough" responses 3.75 (±3.03), 2.88 (±2.38), 2.53 (±2.02), and 2.10 (±3.84) for those with less than high school, some college or university, university undergraduate, and university Masters degrees, respectively. Those not presently employed responded "don't know enough" on 3.42 (±2.88) questions, compared with 2.79 (±2.57) by those employed full-time (p < 0.01). Region of the country, urban vs. rural residence, and age were not significant factors for number of "don't know enough" responses. In progressing towards a model of factors associated with increased vaccine acceptability, we conducted a series of analyses using the self reports of vaccine acceptability as the outcome measure, and attitudes/knowledge items, collapsed and summed into subscales, as predictor variables. Figure 1 shows the items that were grouped into the subscales used to reflect predictor variables. Employing multiple logistic regression analyses we derived three factor models in all, one to predict the self reported acceptance of flu vaccine (in the past year) and two additional models to predict the projected acceptance of vaccines for HIV-AIDS and Hepatitis C, when and if they become available. We derived the best 'fitting' models and in each case found the significant predictor variables were either perceived vaccine safety, vaccine effectiveness or vaccine knowledge, although the most significant predictors varied according to the specific vaccine. As can be seen in Table 4 the results are fairly consistent across vaccines as observable when scanning the varying Odds Ratios and Significance Levels. The objective of this survey was to obtain a baseline measure of several key domains of attitudes and knowledge concerning vaccines in a population-based sample. Due to an absence of similar studies and the lack of comparative results, it is difficult to ascertain how representative our findings are and how modifiable or volatile attitudes might be over time. It is also not yet possible to assess the validity of results in predicting real behaviours, such as immunization refusal, because data on refusals is not currently readily available. While most Canadians can be characterized as having positive opinions about vaccine effectiveness and research, there are some survey indications that might signal caution. On the question, 'The safeguards used in making vaccines are slack and ineffective', 40.4% of respondents indicated insufficient knowledge, 4.8% indicated uncertainty, while 10.5% agreed with the negatively worded statement. A positively worded question, 'The vaccines available are very carefully and consistently tested for safety', yielded somewhat similar results as 22.9% indicated insufficient knowledge, 4.5% indicated uncertainty while 5.3% indicated negative attitudes to the question. While it is debatable how much lay citizens might be expected to know, content-wise, about the safeguards implemented in producing vaccines, there is little question that positive indications of knowledge are desirable. The 40.4% response of insufficient knowledge may therefore be seen as one indication of where future education efforts might be directed. In the context of this study, it would appear the attitudes subjects hold about vaccine safety and efficacy, and their self-perceived knowledge, generally, are associated with willingness to take either hypothetical vaccines currently in development (e.g. Hepatitis C, HIV-AIDS) or vaccines currently existing (Flu, Small Pox, Anthrax). Most would be willing to take anthrax and smallpox vaccines, in view of the risks of bioterrorism. However, only 50% said they were actually taking the available influenza vaccine. Agreement to take vaccines that were currently unavailable on a widespread basis was higher – perhaps because these were for serious diseases, or because it is easier to endorse the acceptance of a vaccine that does not yet exist. The result of this survey that might be an indication for most concern is the lack of knowledge about vaccines disclosed by Canadians. As many as 45% of respondents did not know enough to comment definitively about the safety of vaccines. Virtually, all substantive theories of behaviour change emphasize knowledge as a necessary factor in adoptive behaviour. Our results thus indicate a need for educational interventions, particularly given the real risks of bioterrorism. If we had to immunize on an emergency basis, either locally or regionally, a stronger base of public knowledge would be a valuable and perhaps highly important asset. Although our survey indicated that 79.4% of subjects held positive views of vaccine efficacy, a majority of subjects (61.7%) were reluctant to dismiss anti-vaccine positions. This may reflect the public's potential for persuasion by pro- and anti-vaccine literature and argument. Perhaps because vaccine technology can appear counter-intuitive, i.e. a weakened pathogen or foreign protein is deliberately inserted in the body, it is an act of social trust to take a vaccine. One must trust the scientific discoveries underlying the vaccine and the production methods of the specific vaccination one receives. Furthermore, one must accept the 'tough love' of herd immunity – that the irreducible risks of vaccines mean some individuals experience the detriment of negative side effects (including fatality) for the beneficial protection of the great majority. In past studies that surveyed vaccinators and non-vaccinators , perceived dangerousness, doubts about efficacy, unwillingness to accept vaccine-mortality, beliefs that physicians overestimate disease risk and perceived disease susceptibility were the most significant factors predicting non-vaccination. Although the study, referred to above, used a highly selective sample, disproportionately selected from higher SES strata, it provided some validation of factors associated with vaccine refusal. The significant associations between our attitudinal and acceptability items can be interpreted as providing support for at least two (dangerousness and efficacy) of the predictive factors indicated in this other investigation. In summary, our results indicate that despite a surprising lack of knowledge about vaccines, most Canadians are prepared to accept new vaccinations. Educational efforts on the part of public health officials may improve public receptivity. On the other hand, the lack of knowledge of vaccines may make Canadians susceptible to messages from anti-vaccination groups. An example of the potential impact of these groups can be seen in the UK where fears over Measles-Mumps-Rubella-induced autism have resulted in significant reductions in MMR coverage and consequent outbreaks of measles . If these impacts can occur under normal conditions and vaccination schedules, we may be more susceptible under conditions of heightened anxiety and emergency immunization. PR, JI, NK, KW, LB, AR, RR, and MK participated in survey construction. AR performed survey translation. PR, JI, NK, KB, and MK completed data analysis. All authors participated in rough and final drafting.